USS-LIBERTY TC® offers you the freedom to choose. Now offers even more applications with its extended range of up to 10-3/4" pipe outside diameter. Proprietary TightFit™ thread form provides improved performance in collapse, compression, and torque. This rugged connection is ideal for horizontal and extended reach wells, high-pressure hydraulic fracturing, sour service and more. 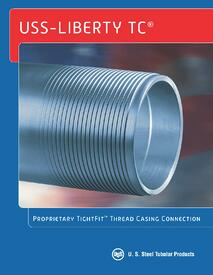 Download the USS-LIBERTY TC® brochure for additional information about features and benefits.